The building comprises a detached three-bay, single-storey school, with a single-storey entrance porch to the gable. Though it retains it’s roofing which is in relatively good order, inside the building is bare; the floorboards have rotted, the glazing is gone, and it is vulnerable to the high winds at it’s exposed location. Some paint work remains on the interior of the walls, and fragments of the surrounding dado rails are also visible. However, the only real feature of note is the brick fireplace at the gable end. Trawling through the Folklore Commission School’s Collection*, Glaun at first appears to be absent from the record. However, on closer inspection, it appears that the stories gathered in this little one-roomed school house in the 1930s, may have been grouped with four other schools: An Tulach, Midhros, Cill Mhic Aibia and Cill Fachtna Beag; all in West Cork. The transcription of these stories from five separate schools are all attributed to just one teacher, Mícheál Ó Cuileannáin, but it is unclear why. All the stories are recorded in the Irish language with the old Gaelic script, and relate to areas on the islands and headlands of West Cork. Perhaps someone out there can shed some light on the relationship between these schools in the late 1930s? To the northeast of Mount Gabriel there is a little two-roomed school house located at Derreenalomane. It is surrounded and hidden from view by impenetrable briars and bushes. Again it is but a shell, and it would almost seem as though the dense vegetation is helping to hold the building together. By the door there is a date plaque which puts the construction of the building at 1898. There is little that I can say about the form of the school building at Derreenalomane, as the interior cannot be accessed because of it’s overgrown exterior. But I did come across some interesting stories in the Folklore Commission School’s Collection* for the school. By far the most interesting was an entry which documents the making of clothes in the locality at the turn of the century. The third school house in view from the summit of Mount Gabriel is at Kilthomane National School. Like the examples at Glaun and Derreenalomane, this building is now but a shell; weather beaten with plaster almost absent from the rough stonework walls. However, with the stonework in view, it is easy to see how rudimentary these buildings were-although constructed to designs supplied nationally by the Office of Public Works, the construction was carried out locally by local people using local materials. Brickwork surrounds the window and door openings, but the remaining stonework was collected or quarried locally. As I mentioned above, Kilthomane is quite similar in form to the school house at Glaun. The building is perched overlooking the R591 and the coast in the near distance. Perhaps it is the exposed location by the coast that gives this building it’s particularly forlorn aura. The surrounding area is barren and empty. One further school house that it is in line of sight from Mount Gabriel, is Dunbeacon National School. The building was in good order until recent years, though the roof collapsed in 2015. Situated by Drishane Bridge in the village, the building comprises a two-roomed, single-storey school building identical to the example from Hollygrove townland in Co. Galway. The building comprises a detached four-bay single-storey school, dated 1902. It has a pitched slate roof, with rendered chimneystack, and cast-iron rainwater goods. The main entrance is a square-headed door opening, head being about mid-point of windows, and having timber battened door. There are also fixed timber paned windows with limestone sills. The paragraphs above describe four school houses on Dunmanus Bay that date to the turn of the 20th century. They vary in form and size, though the role they played in the local community was the same regardless. Today, you will generally find these empty buildings in the most sparsely populated of areas. Often hidden on mountain sides, or crumbling behind ivy, they remain as testament to times past, and symbols of changing educational needs. In a final note, I like to mention that none of the above schools are recorded in the National Inventory for Architectural Heritage for Co. Cork, even though schools of identical date and form in other parts of the country are. This is a problem that I’ve encountered across the country, and displays a lack of homogeneity, and a serious unreliability in the NIAH for Ireland. Each of these buildings once played a vital social role in the local community, and it’s a shame that neither social and architectural value have been overlooked. 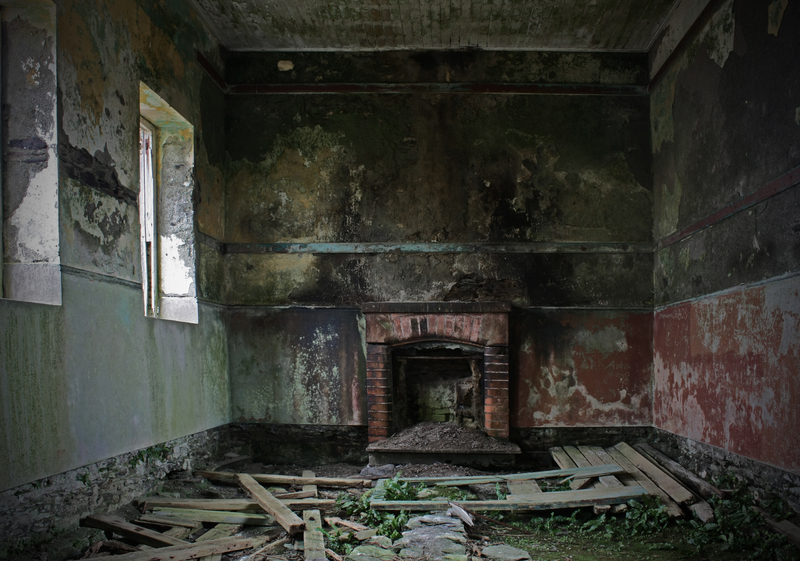 Great journal entry Enda – it’s amazing what can still be found out from a shell of a building! I’m especially fond of Dunbeacon but since the roof went it’s deteriorated rapidly. There are such nice colours inside and a real presence of the children. Did you manage to fight your way through the Japanese knotweed to the the privies at the back? Dereenalomane also has is privies but it’s currently impossible to get close to as you discovered. Thanks so much for the mention and we will get together in the new year for I think you would like St James in Durrus, if we can get in! I’d have to arrange to get the key for that.